Sometimes you need that little extra space. It’s also nice to be able to have that little extra space and the security of All-Wheel Drive (AWD) as well. Historically, the longer a vehicle is, the less maneuverable and more easily stuck in inclement weather it becomes. That’s where the AWD comes in handy. Not only will it give you the advantage of having superior traction capabilities but it also improves handling. It’s much easier to go into a skid or be subject to hydroplaning with 2-wheel drive vehicles. Having an AWD increases the chance of pulling out of a skid in wet weather and lowers the risk of getting stuck in snow. Not to mention the ability for extra hauling space to weigh the vehicle down and improve traction even further. So, if you’re looking for handling, space, and reliability all rolled into one, here are the best AWD wagons of the past few years. Most may consider a 4-cylinder wagon lacking power. Not true with the 9-3. Thanks to a turbo-charged 2.0L 4-cylinder engine, the 9-3 will put out nearly 220 horsepower, more than ample for a car with perhaps the best ride in its class. Not to mention the warranty given with new models. There will be no powertrain issues that will not be covered by Saab within the first 5 years or 100,000 miles. It also comes equipped with a 6-speed Sentronic transmission which not only provides a smoother shift, but faster acceleration as well. Whether it’s a wagon, sedan, or coupe, when you drive a BMW, you’re driving in luxury. It doesn’t take long driving the 5 Series Wagon to know that the acceleration, handling, and performance of this vehicle makes you forget you’re simply going to the grocery store to load up the back end. It handles like the coupe, has the roominess of the sedan, and the AWD feature that will make driving in any type of weather enjoyable. The warranty is outstanding but technicians won’t always find the major problems the first time around; there’s just too much to this vehicle. Now here’s a wagon with power! The AWD in this vehicle wasn’t equipped so much for handling as much as it was to keep the car attached to the road. 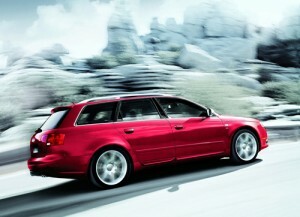 Sporting a beefy 4.2L V8, the S4 has more than what it needs to haul any cargo you can cram into it. The AWD feature on this vehicle is very nice, yet very expensive to fix if it breaks. Knowing Audi’s reputation for reliability, that should be a rare occurrence, but it’s always possible with anything mechanical. It’s been a while since Mercedes changed the look of, or what’s under the hood in, the E-Class wagon, and that should tell you a little something about their happiness with the quality of this vehicle. Despite some minor issues with the parking brake system and complaints about the visibility through a sleeked-down windshield, the Benz E-class is one of the more reliable vehicles out there. Slightly more cramped than you’d expect a wagon to be, especially in the back seat, it still rides and feels like a Mercedes. Even though the Pontiac brand has gone the way of the dinosaur, they’ve left a nice impression on their way out with the Vibe. Riddled with suspension and electrical issues at the beginning of its creation, the Vibe has come a long way. If you’re looking for luxury, look elsewhere. If you’re looking for comfort, dependability, and fuel efficiency, you may have found your match. The fact that the Vibe sits higher off the ground than most standard wagons attributes to its superior handling in snow and rainy weather. It is also much more economically priced than its competition. However, with the absence of the brand name, you may find that finding parts, and eventually repair facilities, hard to come by in the future. No Subaru Outback???? Are you kidding me?